Licensed veterinary chemical manufacturing facilities are audited under what can be described as ‘enforced self-regulation’. Manufacturers are responsible for ensuring they have an effective quality management system. This means the onus is on the manufacturer to have an effective quality management system that effectively maintains product quality. The Agvet Code places responsibility for maintaining operational control of manufacturing facilities on the nominees for production and quality, which is assessed by the APVMA at audit. As the regulator, we periodically assess whether the manufacturer’s quality assurance system is operating effectively. In most cases we will provide the manufacturer with a compliance report which can be used to strengthen areas of weakness. 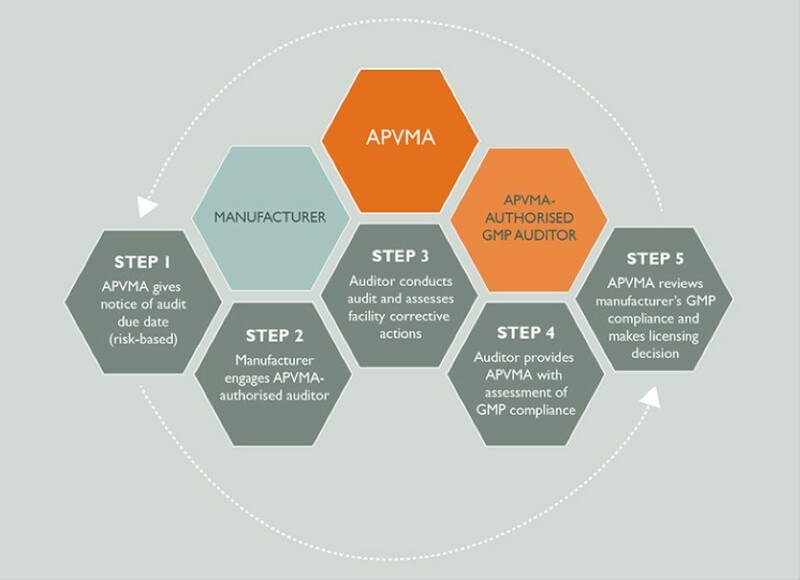 The below diagram outlines the various steps in the GMP audit cycle and the roles of manufacturers, auditors and the APVMA.